Travelling the 38th Parallel: What’s Happening Now? Three years ago, David and Janet Carle, authors of the new book Traveling the 38th Parallel, embarked on the trip of a lifetime. The former state park rangers from Mono Lake, California journeyed around the world along the 38th parallel in search of water-related environmental and cultural intersections. An internal state audit of the 4 Rivers project (reported on January 19, 2013, at Donga.com), by the Board of Audit and Inspection, found that “16 dams that were the key parts of the restoration project had problems in durability and safety. The report also claimed that ‘unreasonable management’ caused fears over deterioration of water quality. […] The findings suggest that the government rushed to complete the project before President Lee left office, causing breaches in quality control and exposing sign of shoddy construction.” The government disputed the findings, but scheduled its own audit. Read on for more about the audit’s findings and to see the Carles’ controversial post about the project from 2010. 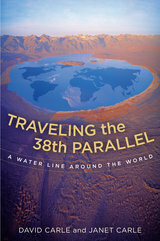 Visit David and Janet Carles’ blog Parallel Universe to learn about the dedicated individuals working to protect the fragile places along the water line, and to see more images, news, and reviews related to the book.